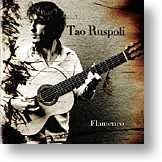 Album Review - Tao Ruspoli "Flamenco"
For those of you not familiar with this label, I direct your attention to my interview with Pierre Sprey. First and foremost I would have to define Tao Ruspoli as a man fanatically given to the pursuit of Flamenco. Son of an Italian noble and an American actress, he is a filmmaker who has several documentaries to his credit (including one on Flamenco that I am dying to get my hands on). His passion for Flamenco started somewhere in his early teens, when he had just started to play the guitar. During a trip to Italy, he was introdued to Keith Richards (of the Rolling Stones) by his father. Upon hearing that Tao was learning to play the guitar, Keith suggested to the young boy that Flamenco would be the genre to pursue. Tao has not veered off that course since. So commited he is to ensuring that his pursuit remain pure, that he does not soil it with an expectation of financial gain or livelihood. He'd rather make his money elseways (filmmaking), and not pollute his music with commerce or finance. My hats off to this man...a modern day hero, of Flamenco no less. This album contains representative pieces from the various palos (forms) of the Flamenco genre. The guitar in Flamenco is generally considered to play a supporting role...actually, cante (singing) is considered to be the principal element. I had requested an evaluation copy of this album, from Pierre Sprey, simply because the samples on his webpage sounded fantastic even over dinky PC speakers (and I will seek out anything related to Flamenco). But, frankly while I expected great sonics, I had set my expectaions low for the content. After all, we are talking about a Flamenco album that is solo guitar...all my other Flamenco albums have some or a lot of cante, footwork, castanets and percussion. I was fully expecting a nice sounding guitar album, but lacking the full emotional involvement of the others in my collection. Boy was I wrong...I cannot recount the number of times this album has made my hair raise on end. I was quite naive to underestimate the charge I would get from music that is so passionately played and recorded. It is worthwhile to note that there also is a classical piece "Recuerdos" [de la Alhambra], composed by Francisco Tarrega. It is quite ironic that this piece would be featured on an album titled "Flamenco"; since it was Andres Segovia who played this piece into popularity and Segovia's stated claim was that he "rescued the guitar from the hands of flamenco gypsies". A sentiment that reeks of bigotry...shame it came from such a brilliant musician. Nonetheless, the tremolo technique used to play this piece is considered a particular challenge by guitarists, and Tao executed it beautifully. What do you get when you take a guitarist as passionate as Tao; with a $20,000 Flamenco guitar; playing compositions from arguably the most emotionally charged genre; and recorded by Pierre Sprey. A reference recording of course...both aesthetically and sonically.